I don’t know what I would have done without y’all. I am so blessed to have you here, and y’all will be blessed, too. This will come back to you. It might not be now, it might not be when you expect it, but this will come back around to you. -Mr. Joseph, an Annual Rebuilding Day project recipient, addressing our group of UL volunteers. They repainted the entire exterior of his home, replaced the carport roof, fixed some rotten siding, and replaced the living room floor. I’m gonna miss having y’all around! It was so nice to have everybody here in the house, helping me and keeping me company. I’ll never forget you. -Ms. Alice, a homeowner in Duson. We tore up old moldy carpet and replaced it with vinyl and did a lot of HVAC work (thanks to Lee’s AC for lending us their skilled labor). I’ve been needing these repairs for some time now. It’s a blessing to have y’all come here and fix my roof. 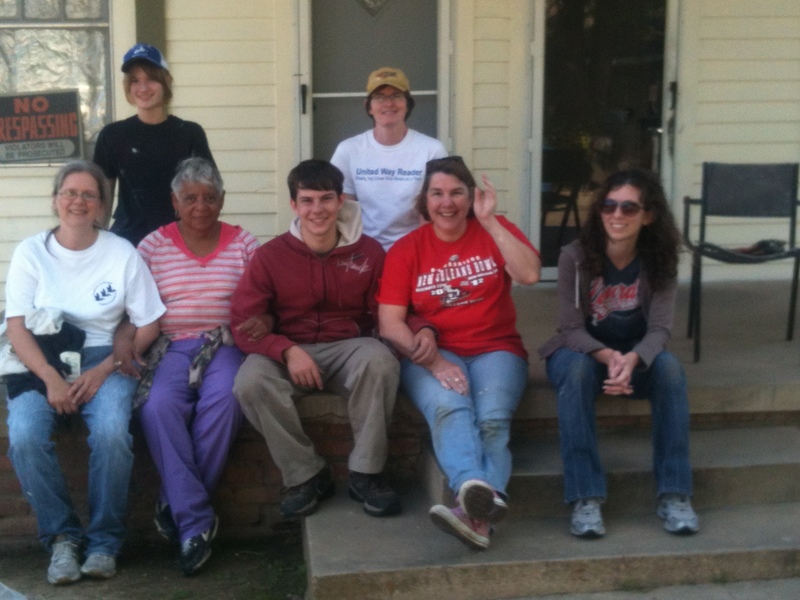 -Ms. Madeline of New Iberia, who received a new roof during our Alternative Spring Break week. She then proceeded to cook the volunteers delicious homemade fried chicken and veggies! Well, it’s official: Rebuilding Together Acadiana’s Annual Rebuild Days 2013 were a great success! On April 6 and April 13, we had volunteer teams working on various homes throughout Lafayette, making repairs, adding safety features, and increasing their energy efficiency. Between the two work days, we had teams work on 11 homes (with some more scheduled to be completed later this month). The days were filled with hard work, laughter, paint stained clothing, networking, and happy homeowners. The Unitarian Universalist Fellowship of Lafayette with Miss Mabel, our welcoming and helpful homeowner! This was their first year – and they absolutely blew us away with their work ethic and success! Our teams included individual volunteers, non-profits, churches, private companies, school groups, and many more. The beauty of the project was the collaboration between people from all different walks of life, banding together to help their community. Homeowners were so appreciative of the effort, and many were not shy about jumping in themselves to help out the volunteer teams! 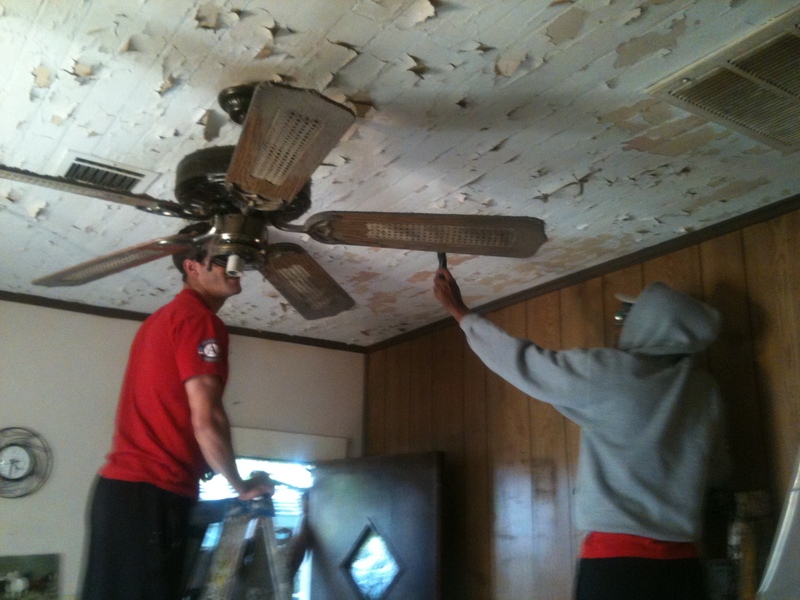 UL AmeriCorps volunteers scrape and repaint a peeling ceiling, reducing the amount of debris and increasing air quality. The work crews were not the only ones who contributed to the success of the builds. We had teams bring in lunch for the crews, old Rebuilding Together AmeriCorps members come back to offer their expertise, and friends drive in from out of town to assist. The day was a phenomenal representation of what can be accomplished with collaboration, passion, and determination. Though the Build Days are over, Rebuilding Together Acadiana has so much more in store for the remainder of the year! Our Ramps & Rails Program has a few more weeks left in the spring semester with the UL AmeriCorps members. There are some veteran’s projects in the works, and there will be more volunteer opportunities coming up. Stay tuned – we’re still going forward, full speed ahead.